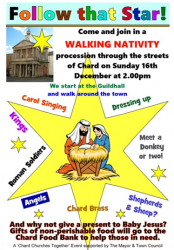 One date for your diaries is the walking nativity, organised by Chard Churches Together. Follow that Star! will be held in Chard on the afternoon of 16th December. The procession will begin at the Guildhall at 2pm. The event will include carol singing, dressing up, Chard brass band and yes, even some donkeys. All this and more, so it will be a fun event for all ages. On Sunday 17th December, join us from 5pm for a Christmas tea. 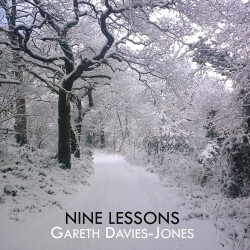 We'll then have our carols and candles service at 6.30pm. Saturday 16th December is a good time to pop over to Chard Baptist Church... there'll be Messy Christmas in the main church building, mince pies on the forecourt and a Christmas fayre in the hall. Do stop by and see us, between 10am and 12noon! For those wanting to plan their December calendars, there will be a joint Advent service at The Church of the Good Shepherd on Sunday 3rd December at 3pm. Messy Church, together with mince pies on the forecourt and other stalls, will be happening on Saturday 16th December from 10am. Candles and carols will take place on the evening of Sunday 17th December. There will be a Scratch Nativity on Christmas Eve at 10.30am. Our Christmas Day Service will be at 10am.